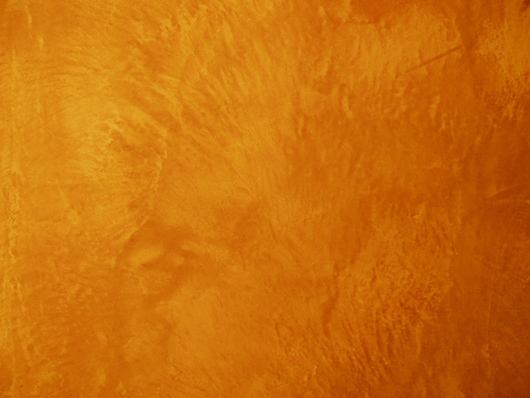 Venetian plaster is a smooth and often shiny plaster design that appears textured but is smooth to the touch. 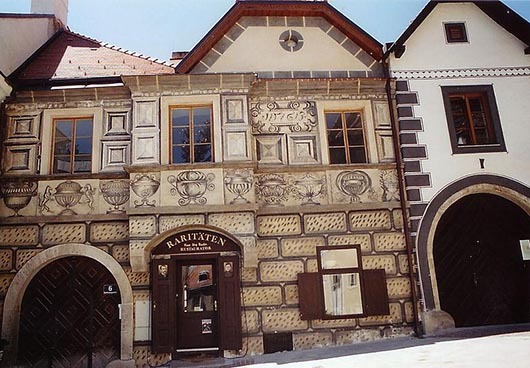 It is one of the most popular and traditional of plaster decorations. 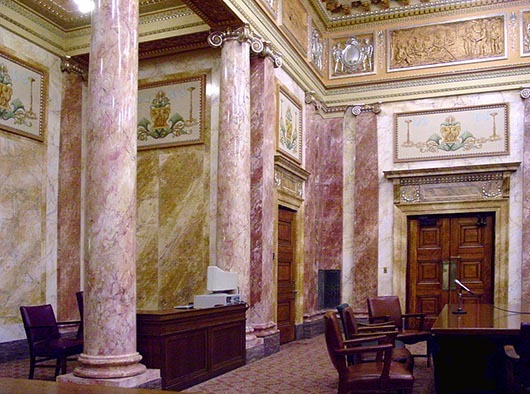 It is a wall and ceiling finish consisting of plaster mixed with marble dust applied with a spatula or trowel in thin multiple layers which are then burnished to create a smooth surface with the illusion of depth and texture. 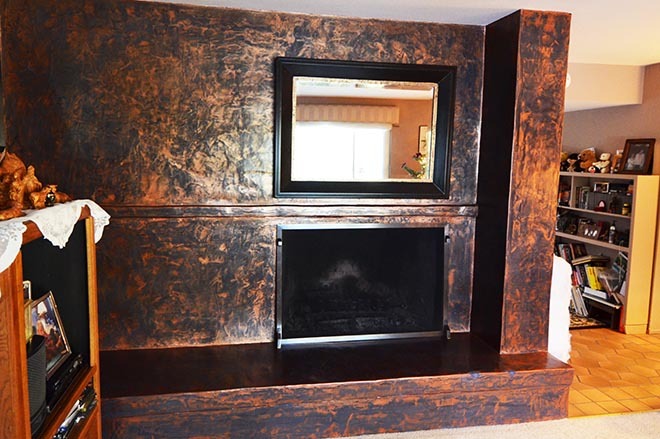 When applied correctly Venetian plaster can be used to create a highly polished, rock-hard, marble-like finish. 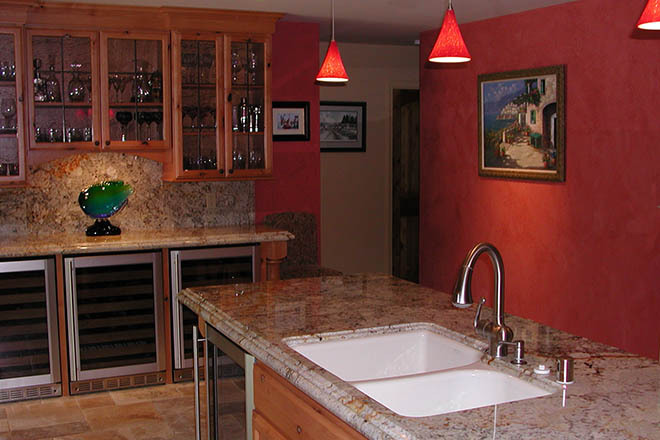 Venetian plaster is especially useful on surfaces where marble panels could not be installed easily and on surfaces that would be too expensive to have carved from real marble such as columns, corbels and curved walls. 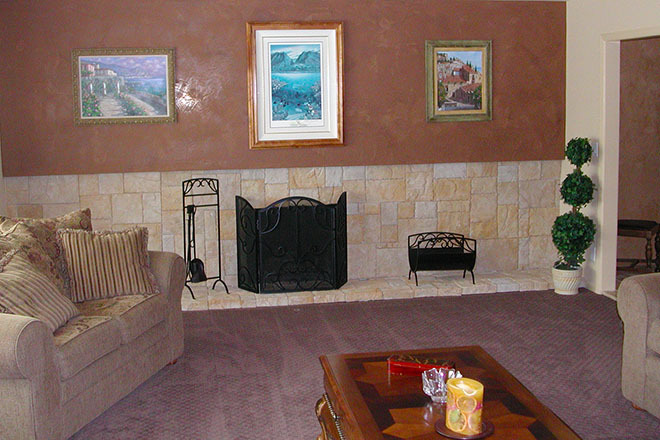 Venetian plaster can be tinted or colored using natural or synthetic colorants. 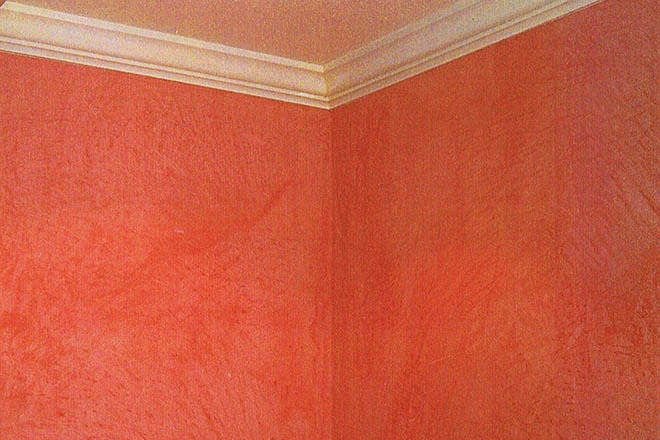 The ability to tint Venetian plaster is especially helpful when a specific color of "marble" is desired, or when a color that does not exist naturally is wanted. 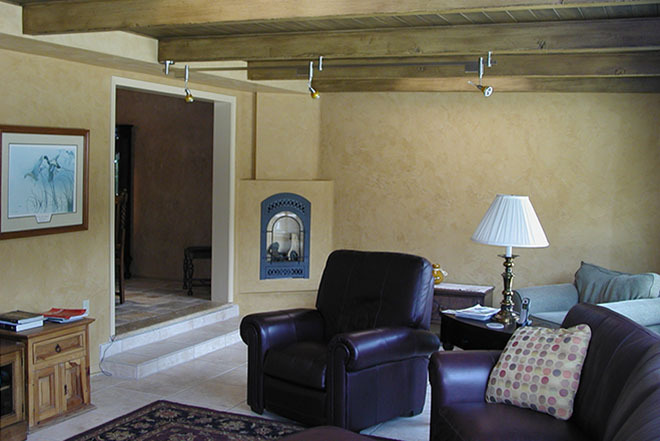 When left un-burnished Venetian plaster has a matte finish that is rough and stone-like to the touch. 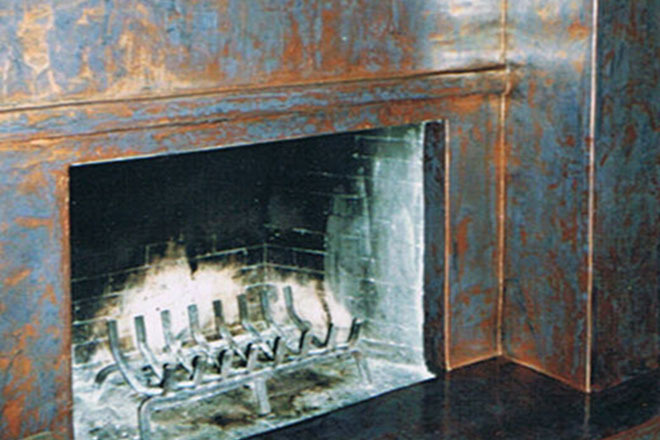 Un-burnished Venetian plaster is also very brittle and damages rather easily. Techniques include marmorino, scagliola, and sgraffito. 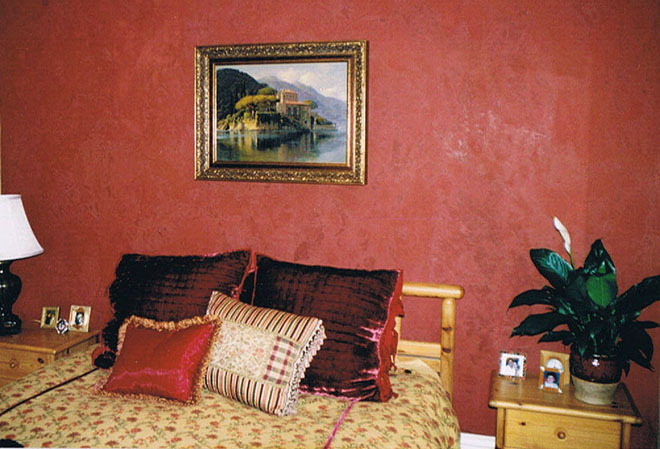 Marmorino Veneziano is a plaster or stucco decoration used on walls. It was used as far back as Roman times but was made popular once more during the Renaissance five hundred years ago in Venice. It is made from crushed marble and lime putty which can be tinted to give a wide range of colors. This can then be applied to make many textures from polished marble to natural stone effects. Widely used in Italy its appeal has spread through North America but now worldwide. Because of the hours of workmanship involved pricing places it in the high-end market. However, many examples can be seen in public buildings, bars, restaurants, etc. Its waterproofing and anti-bacterial qualities as well as visual effects have also made it very desirable for luxury bathrooms and other wet areas. Not confined to interior use, it can be seen on the exterior of many buildings to great effect. Scagliola (from the Italian scaglia, meaning "chips"), is a technique for producing stucco columns, sculptures, and other architectural elements that resemble inlays in marble and semi-precious stones. The Scagliola technique came into fashion in 17th-century Tuscany as an effective substitute for costly marble inlays such as the pietra dura works created for the Medici family in Florence. Scagliola is a composite substance made from selenite, glue, and natural pigments imitating marble and other hard stones. The material may be veined with colors and applied to a core or a desired pattern may be carved into a previously prepared scagliola matrix. The pattern’s indentations are then filled with the colored, plaster-like scagliola composite and then polished with flax oil for brightness followed by a coat of wax for protection. The combination of materials and technique provides a complex texture and richness of color not available in natural veined marbles. A comparable material is terrazzo. Sgraffito is a technique of wall decor produced by applying layers of plaster tinted in contrasting colors to a moistened surface and then scratching so as to produce an outline drawing. Copyright © MMXIX | Surfaces Painting and Decorating, Inc. | Lic. 805057| All rights reserved.